Here we have answered some of the more frequently asked questions from couples. But should you have any further questions regarding Sopley Mill please don’t hesitate to contact us. For bookings at the Mill we would ask couples to select their caterer from our extensive list of suppliers. These caterers have worked at the Mill since we opened. They know how the building, how it works, what equipment we have and therefore what they need to bring with them. There are plenty of options to choose from, from the regular award winning wedding caterers in this area to mid-range but passionately run smaller caterers and quirky options such as hog roasts, paella and even a jalopy with a wood burning pizza oven in it! What type of music are we allowed? To ensure we comply with NFDC sound regulations, under our entertainment license, we have to monitor levels carefully. In order for us to do this we would ask anyone hiring the Mill and wanting to have a DJ to use We Perform. They are very competitively priced and passionate about what they do. You are more than welcome to have a band if you would like one. The same sound regulations would apply so we would ask that you only use professionals as they understand sound engineering. If you would like to have a band we need to speak to them before you book them to go through the restrictions and how the band are going to ensure they remain within the sound limits (95 decibels for internal music). For the same reasons we regret that we cannot have evening music which isn't controlled by professional suppliers. You are more than welcome to supply your own alcohol and we don't charge corkage. You have two options regarding drinks at the Mill: You can supply your own drinks and hire staff through Tom's Bespoke Bartending Co (the licensed bar company at the Mill) to serve these at the wedding reception and breakfast or event. You will need glasses for these and to remove all bottles and hired glassed at the end of the evening. To ensure we comply with our Alcohol License all evening drinks MUST be served by hired Tom's staff from behind a bar (this does not include Tom's bar equipment, glasses etc which can be supplied as part of a 'Dry Bar'). OR you can organise a paybar or any drinks package through Tom's Bar. Tom's bar will provide staff, glasses, bar equipment, ice machine for any drinks sold through Tom's. You are more than welcome to supply your own alcohol and we don't charge corkage. You have two options regarding drinks at the Mill: You can supply your own drinks and hire staff through Tom's Bespoke Bartending Co (the licensed bar company at the Mill) to serve these at the wedding reception and breakfast or event. You will need glasses for these and to remove all bottles and hired glassed at the end of the evening. To ensure we comply with our Alcohol License all evening drinks MUST be served by hired Tom's staff from behind a bar (this does not include Tom's bar equipment, glasses etc which can be supplied as part of a 'Dry Bar'. OR you can organise a paybar or any drinks package through Tom's Bar. Tom's bar will provide staff, glasses, bar equipment, ice machine for any drinks sold through Tom's. Can I park my car at Sopley Mill? 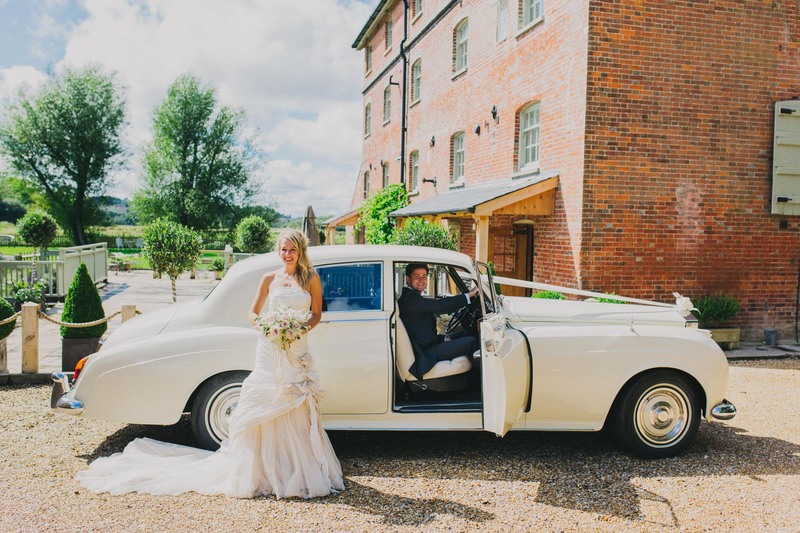 Your guests are able to park in the car park and lane next to Sopley Mill overnight and without charge. However please bear in mind that it is not a secure car park so we cannot guarantee the safety of your car or any valuables left inside it. Please note that camper vans are not permitted to remain in the car park overnight. We would like to have a sweet cart at our wedding, is this allowed? Yes, sweet carts/tables are permitted. We have three wooden high chairs here at Sopley Mill which are available for use during the wedding breakfast. We do not however have any booster seats here so clients would need to supply their own. Are fireworks permitted within Sopley Mill grounds? As Sopley Mill is in a Site of Special Scientific Interest fireworks are not permitted however you are more than welcome to use sparklers. Do I have to take everything with me at the end of the night or can I collect my leftover items the next day? Ideally, presents and other valuables should be taken away at the end of the evening. We do require all caterers to clear away any food/plates etc that they have used and take their own rubbish with them. We often have back to back weddings so all your items and suppliers items need to be removed that evening or can be left in the ground floor kitchen for collection by 10:30am at the latest the next day. For suppliers they must collect any items by 10am the next day. Christchurch Chritax (01202 470000) or taxi@470000.com. For guests requiring taxis, early booking is strongly advised, especially for Friday and Saturday weddings, as Bournemouth and Christchurch town can be extremely busy on these evenings. What time does the evening reception finish? We do apologise but we do not permit confetti at Sopley Mill as we are by the river and in an environmentally sensitive area. Yes, Sopley Mill is fully accessible. We have a lift to the top two floors (not the Avon Suite/Bridal Suite) and a disabled toilet on the ground floor. Please note that whilst we have tried our best to make the Mill disabled friendly we are limited by what we can do in a listed building of the Mill's age. We highly recommend that you see the Mill and confirm it is going to work for you or your disabled guests before you book. The lift's capacity is 315kgs and is 92 by 141cms in size. Guests are permitted to smoke within the grounds of the Mill, but not within the Mill itself. If centre pieces for the tables include candles, these must be enclosed by glass or set within a wide, solid base. For Health &; Safety reasons naked flames are not permitted. Tea lights, in shallow holders, are not allowed. Wax spillages may incur specialist cleaning charges. If you are in any doubt, please liaise with your chosen caterer. Battery operated candles are an effective and much safer alternative. Flare torches are not permitted for use within the grounds to prevent damage to the property and grounds.